China did not take kindly to Tillerson’s blunt criticism of Chinese foreign policy. 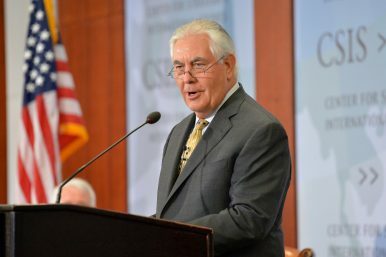 On October 19, the Chinese foreign ministry urged the United States to “abandon its biased views of China,” after the U.S. Secretary of State Rex Tillerson sharply criticized China in a public speech in Washington, DC one day earlier. The Chinese side is committed to the sustained, sound and steady development of China-U.S. relations, which not only serves the fundamental interests of the two peoples but also represents the shared aspirations of the countries of the Asia-Pacific region and the international community. We hope that the United States can put China’s development and China’s positive role in the world into perspective, abandon its biased views of China and make concerted efforts with China to focus on cooperation, properly handle differences, and maintain the momentum of the steady growth of China-U.S. relations. The sentence above in fact is exactly what Chinese President Xi Jinping had just said in his three-and-a-half-hour-long work report at the Chinese Communist Party’s (CCP) 19th Party Congress. In the report, Xi claimed that China’s development will not pose a threat to any country. “ No matter to what degree China develops, China will never seek hegemony or engage in expansion,” Xi said. At the same time, no one can force China to “swallow the bitter fruit which damages China’s own interests,” he added. That Chinese foreign ministry chose to downplay its reply to Tillerson is likely an attempt to maintain a smooth relationship ahead of U.S. President Donald Trump’s upcoming visit in November. For the same reason, most observers in China are puzzled about why Tillerson decided to criticize China so sharply ahead of Trump’s visit. Is it really a sophisticated diplomatic tactic for the United States to upset China so soon before the country hosts Trump? Tillerson’s intention to send a friendly message to India is more understandable, as he is scheduled to visit New Delhi and “meet with senior Indian leaders” in the next few days.